Maybe it was the staccato chant of auctioneer Donald Bennett. Maybe it was the commotion and excitement of animals parading, as if it was a 1950s Noah’s Ark re-enactment. Whatever it was, I wanted to spend my summer Thursdays at Wayne County Stockyard. I was hooked on critters. My buddy, Steve Strickland, and I had the run of the sprawling complex on the Waycross Highway. His granddaddy, Ira, and Steve’s daddy, “Strick,” owned the place. Besides hanging on the railing of the sales ring, our favorite place was scampering around the elevated catwalks overlooking the maze of pens. With all the mooing, bleating, squealing and oinking, we had to holler back and forth to talk to each other. I loved overhearing the men—especially Allie Edenfield and Elton Tillman—swap stories. In 1956, a pop-up toaster was the fanciest gadget in our house. So, when Elton said he wore his magical overalls, gullible Steve and I believed him. He said that, when he put on his special overalls, music started playing. Sure enough, we heard tunes coming from the bib pocket on his chest. Elton almost pulled off the prank, until we overheard him telling a buddy about his tiny, battery-operated transistor radio. As 8-year-olds, Steve and I earned our first paychecks at Wayne County Stockyard. With oak sticks, we poked and unloaded livestock off trucks. But when wild cows—trapped on Sapelo Island—were brought to the barn’s chutes, we were warned to stay back. One day, a delirious cow jumped out of the sales ring, bolted up the wooden bleachers and sailed through a two-story window. Steve and I didn’t have to be told twice. The beginning of the Lake Hartwell menagerie was two strawberry draft mules, Ruby and Rose, purchased from Randy Leggett. Then we bought four goats. Those three nannies and a billy begat more goats until we had 75. Our backyard “stockyard” soon added miniature donkeys, llamas, bantam chickens, Royal Palm turkeys, Belted Galloway cows and Great Pyrenees guard dogs. Today, we’re down to a mule, four llamas and six miniature donkeys. But I can feel the goat itch coming back. For now, I’m corralling that notion with another barnyard ambition. 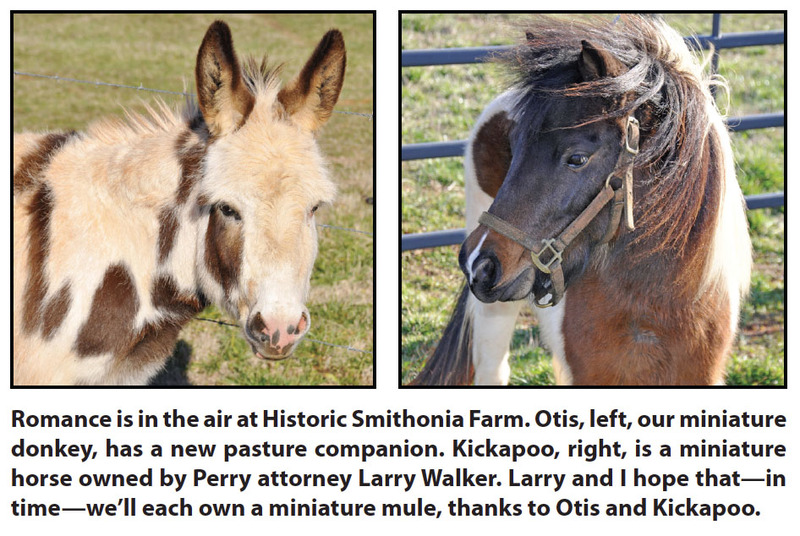 Larry Walker and I share the dream of owning miniature mules. My lawyer buddy and I each have half of the equation. Mules are the byproduct of crossing a female horse with a male donkey. Larry has a striking spotted (paint) miniature pony—Kickapoo—named for the Native American tribe. The sire of my miniature donkey herd is a handsome spotted jack, Otis, who is named for the late rhythm and blues legend Otis Redding. Sometimes when my donkey brays, I think I can hear a faint touch of “Try a Little Tenderness,” just as his namesake sang. She’ll be hanging around our barn for a while. Larry gets the first mini-mule. I get the second one.